No possession could he save. As he tried crossing through the Red Sea. If he drove a SUV. His arms weren’t all that strong. To hold them up for long. 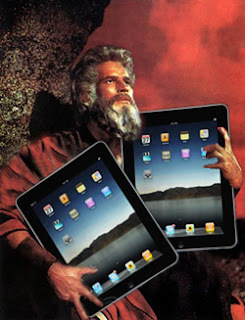 God had given him a Kindle Tablet. “Samuel! Samuel!”, God said one night. Till he hit upon this plan. Not much a fan of sports. Weren’t a waste of time. He sketched her roughly in the sand. He did the best with what he had. If he owned the new iPad. Trying to make and honest liv’in. He threw my stock into disarray. And done my business on eBay. It cast a shadow on the weekend. They were feeling downright beaten. Who announced an empty tomb. If they saw it on You Tube. Is now available at Walmart.